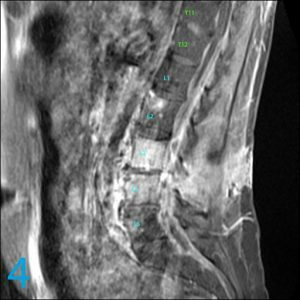 This 45-year-old male presents with lower back pain due to a motor vehicle accident. Have a look at images 1 through 7, and see how many findings catch your eye. 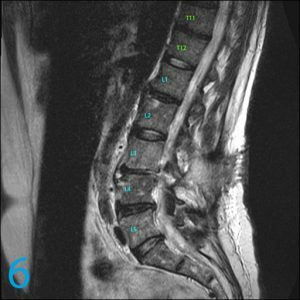 Bone marrow edema within the L3 and L4 vertebral bodies nearly encompasses the entire L3 vertebral body and the majority of the L4 vertebral body, and is associated with hyperintense signal within the intervertebral disc. Patient is post left laminotomy at this level. Edema and swelling track along the left laminotomy site. After administration of intravenous contrast, the surgical site was enhanced via enhancement of the paravertebral soft tissues along the intervertebral disc space (image 7, pink arrows), anteriorly. Furthermore, extensive abnormal heterogeneous signal within the thecal sac, starting at the level of L2-L3 and extending to the sacrum, has peripheral enhancement with central low signal (image 3, purple arrow). 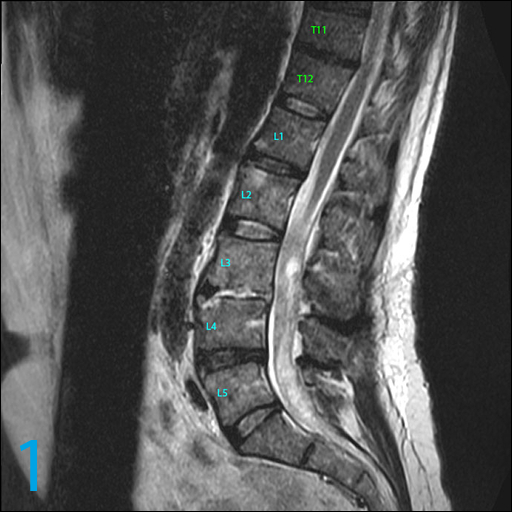 Patient history also indicated discitis osteomyelitis at the L3-L4 level. 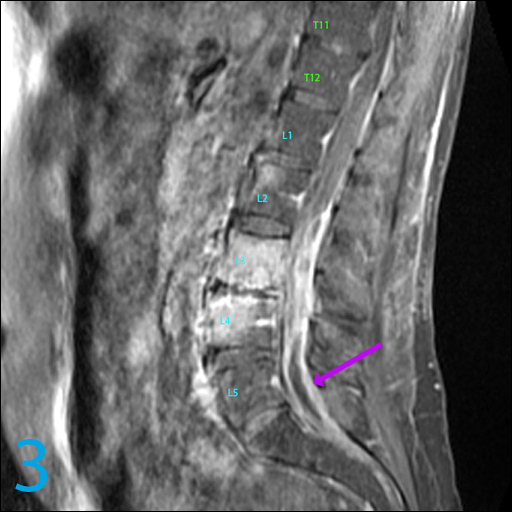 Combination of these findings are compatible with discitis / osteomyelitis at L3-L4 with a prevertebral soft tissue collection, involvement of the epidural space along the left laminotomy site dorsal aspect of L3-L4, and an enhancing intradural abscess extending from L2-L3 to the sacrum. Vertebral body heights are preserved. There is a loss of intervertebral disc space height at L3-L4 with active inflammation and edema. Remaining intervertebral disc space heights are preserved with varying degrees of mild disc desiccation. The thoracolumbar junction is intact. 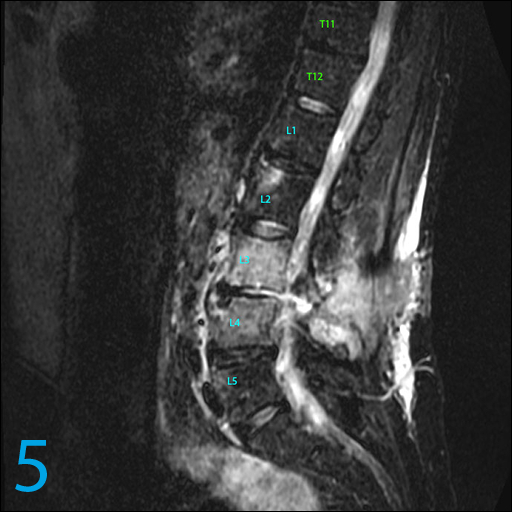 Spinal canal is mildly congenitally narrowed with subtle retrolistheses of L3 on L4, and L4 on L5. Conus medullaris is visualized at L1-L2. 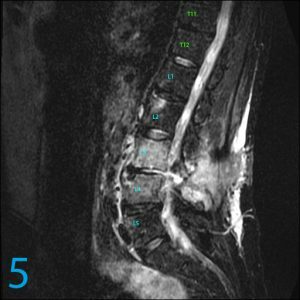 Cauda equina nerve roots are displaced and irregular extending from the conus to the distal thecal sac due to the intradural soft tissue and fluid collection. 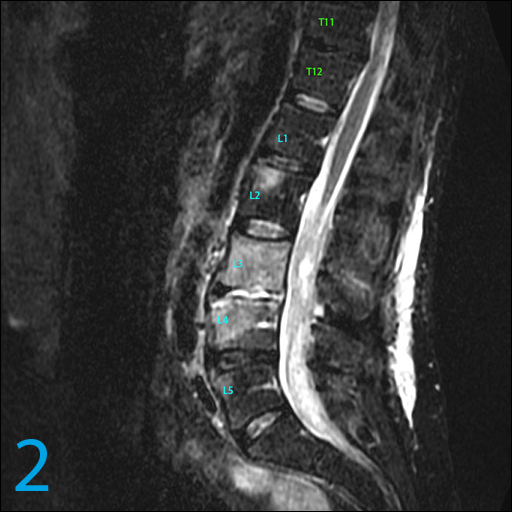 T12-L1: There is no focal disc herniation or spinal canal stenosis. The neural foramina are patent. Mild facet arthropathy is indicated. 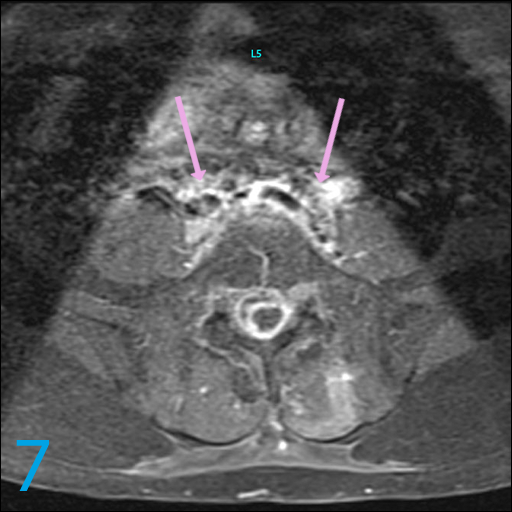 L1-L2: There is no focal disc herniation or spinal canal stenosis. The neural foramina are patent. 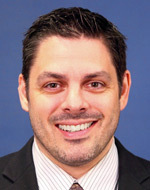 Mild facet arthropathy is indicated. L2-L3: There is no focal disc herniation or spinal canal stenosis. The neural foramina are patent. Bilateral facet arthropathy is indicated. Cystic soft tissue within the thecal sac at this level extends to the distal thecal sac. L3-L4: Patient is post remote left laminotomy at this level. Bilateral facet arthropathy is indicated. Irregular cystic soft tissue within the thecal sac is present without high grade spinal canal stenosis. Left neural foramen is moderately narrowed. Right neural foramen is mildly narrowed. L4-L5: Subtle retrolisthesis of L4 on L5 with a shallow concentric spondylotic disc displacement. Irregular soft tissue within the thecal sac extends towards the sacrum. Bilateral facet arthropathy encroaches upon the neural foramina resulting in mild-moderate foraminal narrowing. 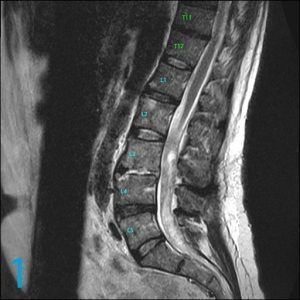 L5-S1: Shallow concentric disc displacement without spinal canal stenosis. The neural foramina are patent. Bilateral facet arthropathy. Abnormal soft tissue and enhancement within the thecal sac extends towards the sacrum. Present is left paraspinal muscle edema, and enhancement along the surgical tract at the level of L3-L4 left laminotomy site. Visualized soft tissues of the abdomen and pelvis are grossly unremarkable.